As I wrote in my last two posts, I went out Sunday evening to attend a surprise birthday party of one of my long-time trans girlfriends. The party started slowly guest-wise, so initially I made small talk with the handful of people who showed up early like I did and in the process, made fast friends with a lesbian couple. When some of my trans friends finally arrived, I hung out with them and caught up on things since the last time we had met. Everyone noticed my new hairdo and said they liked it. But one long time friend said it made me look like an old lady, which confirmed my assessment. I am old enough and don't want to highlight my age, so I was a little upset with myself for not listening to my inner fashionista and rejecting the gray wig as my crowning glory. When I got back home to my boudoir, I replaced the long gray wig with one of my short blonde wigs and immediately shed 10 to 15 years. 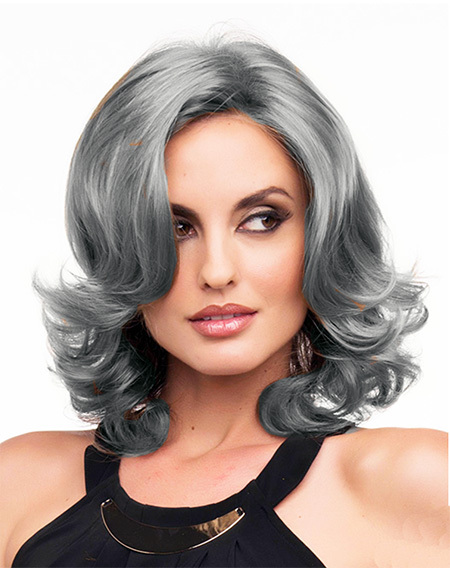 So I will not wear the gray wig again until the day I am so old that the gray wig makes me look younger!